Sing Gospel are dedicated to spreading the love of gospel music; whether this is in their local community in Ealing (London) where they run a weekly choir, singing at community events across the capital and holding their own concerts; or across the UK and internationally, hosting workshops. Founded by Josh Cadman & Bert Routledge in 2010, Sing Gospel have grown to include a regular and highly polished community choir who rehearse weekly in Ealing, and a session choir that represent Sing Gospel in the studio, at corporate events and high profile occasions. Sing Gospel competed as finalists of the BBC Gospel Choir of the Year 2016 and regularly perform at high profile events across the UK, having performed with Dame Shirley Bassey, west end star’s such as Marisha Wallace, and have sung for gospel queen, Whoopi Goldberg. Sing Gospel have performed in some of the best venues in the UK, including The London Palladium and Cadogan Hall. To find out more about joining one of our choirs, come to one of our events, invite us to host a workshop or to perform – look at the links below. Thank you for such an amazing experience. Josh and the crew were so great, we had so much fun. It really was life impacting. If you guys come back we definetly will be joining again and I recommend anyone that missed out this time, join next time, it really is that good. Want to be a part of the Sing Gospel family? Want to be able to perform on stage with your friends? Become a full Sing Gospel member now. Sing Gospel membership is for all singers who want to be fully part of the Sing Gospel family. All singers who would like to perform and take part in other exciting opportunities such as recordings, must be full members. To ensure becoming a member is as accessible as possible, you are now able to pay online via monthly recurring payment, per term or per year. Alternatively you can always pay by cash or card at rehearsal, or via bank transfer. Subscribe Monthly £17.50/month – NEW! Subscribe to Sing Gospel via a monthly recurring payment using PayPal. Minimum of 4 monthly payments is required – equivalent to one term. Become a member for one term. Pay for the whole year and receive a 5% discount on your membership. Come and join us at our brand new venue and become a part of Sing Gospel London. Now based in the state-of-the-art facility at Christ the Saviour Primary School, Ealing. We are a non-audition choir, open to all ages and backgrounds, with no experience necessary. Our repertoire is uplifting, joyous and stirs the soul, covering the gospel genre from Aretha to Kirk Franklin. Rehearsals are light-hearted and fun, and you will be put through your paces! The choir regularly perform around West London, at various community events and concerts – and we host regular Sing Gospel concerts to showcase the choir at it’s best. Full choir membership is £70 per term, or simply pay on the door £6.50, with no commitment! For more information on how you can get involved, please get in touch. Sing Gospel have hosted workshops in Australia, Germany, Poland and across the UK; invite us to host a gospel workshop with you. We believe everyone has a voice, and we can come to your choir, workplace, corporate event, school or church and host a gospel workshop with you to prove it! Our workshops are fun and uplifting, and give people a taste of a what it is to be in a gospel choir, singing 3-part harmony in true gospel style. The sessions are great for the experienced singers and less experienced alike, with our highly experienced choir master, Josh Cadman, tailoring the session to develop and stretch everybody in the group. We hope to give you an opportunity to bring your community or team together to learn new ways of singing. Not only can it be a benefit to an already established singing group, but singers of ALL ability levels enjoy and benefit; therefore we encourage all who like to sing to take part. If you would like to host a workshop, or ask us any questions, please don’t hesitate to contact us. Get deeper into Sing Gospel, stretch yourself vocally, physically and mentally. The Sing Gospel Session Choir was set up in 2016 to provide a space for Sing Gospel members to stretch and develop and also to expand Sing Gospel into new territory. The Session Choir are a professional choir, working to the highest possible level. We are currently taking bookings for weddings, corporate functions and other events for 2016. For a chance of being a member of the Sing Gospel Session Choir, come along to one of our regular choir rehearsals on a Thursday evening at St Mary’s Church, Acton. 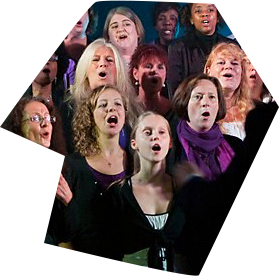 Auditions are held twice a year to community choir members. Please find below a list of our most commonly asked questions. If you can’t find your answer here then please leave us a message. Can you come to our Church or school and teach us Gospel singing? Of course!, see the page ‘Workshops’ for more details. Do I have to come to all the workshop sessions, or can I come to just one? You can come to as many or as few as you like, but you’ll soon get hooked! All our songs and harmonies are learnt by ear. There is no music or words to read – all from memory. I haven’t got a very good memory. Our method is to sing over and over until it is learned. In addition we sell CDs at our workshops with split vocal parts for singers to take away and practice if they wish, see the page ‘CDs’ for more details. I would love to come but I’m not a very good singer. Sing Gospel is for everyone. Those who think they can’t sing soon realise that enthusiasm is more important and singing with others soon builds their confidence. We don’t have anyone at our church or school who will be able to play for us in a service if we want to sing what we’ve learnt. Our CDs are perfect for this. They contain a full mix of the song for you to sing along to, they also have a vocal track to guide you. You can find more information on our Learning CDs page. The workshops are open to all ages, we currently have as young as 7 and as old as…….well it’s rude to ask!!! What sort of songs do you teach? Mainly American and British Gospel from the 70’s right up to the present day including some new arrangements of old hymns, some funky stuff and some sweet slowies.